AEthelflaed, Lady of Mercia – Let Us Live Like We Mean It! AEthelflaed (b. 869, d. 918), the Lady of Mercia and daughter of King Alfred (b. 849, d. 899), and her nephew, Alfred’s grandson, King AEthelstan ((b. 834-d.939), who she raised, are among the people in early medieval English history who are my favorites. As always, I prefer the books to the stuff on the screen, especially since the protagonist on-screen, Uhtred Uhtredsson, is so miserably miscast as a wiry young dark-haired man. He should have been a large brawny blond-haired guy, as he is described in the books. Oh well. Here’s a bit of trivia for you: the Uhtredssons are actually ancestors of Bernard Cornwell. After I enjoy historical novels, even ones as well-researched and written as Cornwell’s, I like- to turn to non-fiction historical sources, either primary or secondary. I frequently consult my copies of the Anglo-Saxon Chronicle. And I’ve read Asser’s contemporary, though slanted, biography of King Alfred. Those are both primary sources. 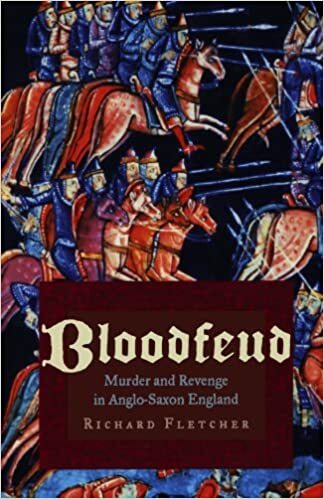 Right now I’m reading a secondary source, the book Bloodfeud: Murder and Revenge in Anglo-Saxon England, by Richard Fletcher. One reason I’m reading it is that at the end of the last volume of Cornwell’s Saxon Tales he cites this book as explaining how his ancient family lost the castle and lands of Bebbanburg (or Bamburgh) that had earlier in history comprised part of the family’s holdings in the Kingdom of Bernicia in Northumbria. So far, much of it echoes the revenge killings I’ve read about in my Viking studies, where people were lured in, without their weapons or armor, under false pretences of parley and then slaughtered to a man. That is what happened to Earl Uhtredsson in 1016. House and church burnings, with people trapped inside, were also a common occurrence. But to return to the Lady of Mercia, AEthelflaed, she was a very striking figure. Not only was she beautiful and well-educated. She also personally led armies under her strange banner of a goose holding a cross. A burh (Old English pronunciation: [ˈburx]) or burg was an Old English fortification or fortified settlement. In the 9th century, raids and invasions by Vikings prompted Alfred the Great to develop a network of burhs and roads to use against such attackers. Some were new constructions; others were situated at the site of Iron Age hillforts or Romanforts and employed materials from the original fortifications. As at Lundenburh (medieval London), many were also situated on rivers: this facilitated internal lines of supply while aiming to restrict access to the interior of the kingdom for attackers in shallow-draught vessels such as longships. Most of these were founded by Alfred the Great in a consciously planned policy that was continued under his son Edward the Elder and his daughter, Æthelflæd, the ‘Lady of the Mercians’, and her husband Æthelred, Ealdorman of Mercia. The Mercian Register tells of the building of ten burhs by Æthelflæd, some as important as Tamworth and Stafford, others now unidentifiable. Æthelflæd as depicted in the cartulary of Abingdon Abbey (British Library Cotton MS Claudius B VI, f.14). 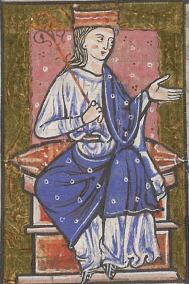 More on King AEthelstan, considered the first King of England, AEthelfleda’s nephew, whom she raised, in my next post! Have you read Annie Whitehead’s novel about Æthelflæd? It’s ‘To Be A Queen’. She’s also written a history of Mercia.